Syllabus of the Online Course (Subject): European Union-Georgia Association Agreement. Learning materials in or Unión Europea-Georgia Union européenne-Géorgie Geórgia-União Europeia. The EU-Georgia Association Agreement entered into force in 2016. 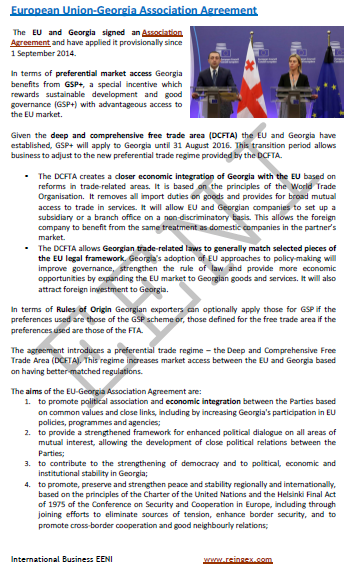 Georgia also has preferential access to the EU through the Generalised System of Preferences (GSP)+ and is part of the European Neighbourhood Policy (Eastern Partnership). The European Union belongs to the European Economic Area (Western Civilisation) and Georgia to the Economic Area of Orthodox Civilisation.